The child seen on the top of this page, you do not know him. Unless, I was to tell you his name, you would name him the “poor, sad-eyed Nicaraguan boy.” For me, I know him…I know where he came from, his name, his situation, his hurdles to conquer, and his victories achieved. 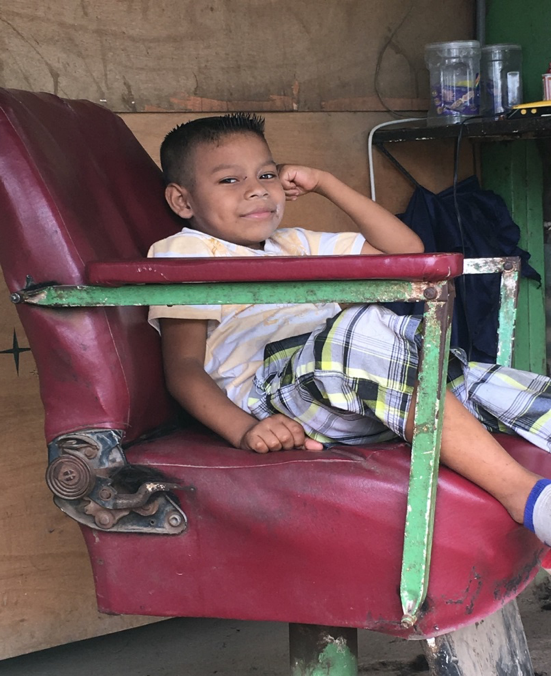 In the midst of the daunting task of answering the mandate and calling of God to defend the fatherless, the “poor, sad-eyed Nicaraguan boy,” he stays me from loosing heart amongst the life-draining needs of fatherless children. I first was introduced to him when I went to his home. A home which was not a home, but more like a patio with a tin roof, no walls. Chickens and turkeys, in multitude, were scratching around the small “farm.” He at 7 years of age, had never been to school in his life. His mother, who hit him and treated him different from his younger, whiter skinned brother, never took interest to enroll him. She blamed it on the fact that she could not buy a uniform for him (not a requirement to study in public schools.) He slept by himself, in a low-to-the-ground makeshift, rawhide cot, while his mother slept with his younger, favored brother in their hammock. What gripped my heart more than the harsh surroundings, was his eyes and what I like to call his “invisible disposition.” He acted as a child who did not exist. He was closed, not talking unless absolutely forced to talk. His eyes never met those of another, and he kept himself entertained alone, by chasing around a chicken or picking around with a stick. When one did look into his eyes, though they never would look back at yours, one saw there a vacuum of sadness that would cause one’s heart to scream out in mortification for the present indignities present in this life. He had been neglected for a long time, so much so, he presented himself as one invisible. From this point on we saw great changes in him. After having a meeting with the director of the local public school, to take in our kids who had never studied and would be starting late for the beginning of the school year, they consent to accept our children. We purchased the needed school supplies, and off went the children, including him to school. There were tremendous academic changes in him, he was like a sponge soaking in everything he could. After 4 months in school and with the individual scholarly assistance of our children caretaker Raquel, he is now starting to read short sentences. Before, as was with most of our children, he could not even write his first name. He also, would not show affection, like some of our other children. When going into town to make purchases for our children’s home, he would not like to hold the hand of an adult, nor would he give side-hugs in demonstration of affection. Just recently, he has begun to take the hand of the team workers, here at the Children’s Home, in order to show them something. After a short one week trip to the USA, he greeted me with a hug, which was HUGE step for him. Now, I have been seeing more smiles (which he has a dimple… making it extra pleasurable to see) and laughter. His eyes now glitter with new found hope and trust in a place where he finds a hope and a refuge from hard surroundings and tuff circumstances where he never knew or was showed pure, true affection. The struggles and challenges are real and can be frustrating to work through. To be real for those who want the genuine insight, not for the gain of pity. I have cried on more than one occasion, at night when no one is around, just because of mere loneliness and wishing to have someone who understands. There has been people who were not for me. There have been children who have had angry fits for not getting their way. Children who defy all and any authority. Then those children, who have acted out sexually, because what they see where they come from. There have been times when friends and family are seen on Facebook or called talking of great momentous events, that you can not be there for. Some may say, “How could you be lonely? Kids are around constantly. How could it be a struggle for you? You have workers here that basically take care of everything.” May I say, these are questions, asked ignorantly, and for that I ignorance I have compassion, for they really must not understand. Yes, we do have children and we do have workers, but having to stand and be the leader remains intact. Being a leader is serving and serving can be a lonely work. Not everyone sees or knows the servant, because a true servant, serves not for glory or recognition or money, but for the cause. Being a leader, means standing alone, when necessary, but still remaining compassionate and showing others that they are not alone, even when you are feeling the same loneliness. This is how leaders can be the most empathetic, because they did not become leaders by going through nothing. Taking all of these struggles and circumstances into account… It has been in the lonely times and struggles, when Jesus, whom no one while he was here on earth seemed to understand, has held me and assured me, “I am with you, I know, I understand, and I see all.” He brings a calm, assurance to me, when none can be there to comfort. I am foolish to write this blog, with the motive of attaining some ounce of glory or recognition. If I did anything for this motive, I would have burned out and left long ago to continue my work as an RN in the USA. It is the mandate of the church, as read above, and my personal calling from God Himself for the fatherless, and story presented of the “sad- eyed little boy,” turned “happy-eyed little boy.” This compels and drives me forward. It is God, Himself, who called us, and continues to equip us with every laborer, every Cordoba, and every resource necessary to accomplish the work. We by faith believe in Him for the miraculous in the lives of the fatherless and orphaned here at the House of Refuge Children’s Home.